The Incheon International Airport offers domestic routes (Incheon↔Jeju) with more expected in the near future. However due to the limited number of flights per day, Transit through Gimpo International Airport is highly recommended to go to Jeju International Airport from Incheon International Airport (Option 2). To travel to Jeju, traveling out of Gimpo Airport is usually a better option. If you are going directly from Incheon Airport to Gimpo Airport for a domestic flight to Jeju, quickest/easiest way is to take an Airport Train from Incehon International Airport to Gimpo Airport (about half an hour from Incheon Airport to Gimpo Airport). You can also take one of the buses located outside the arrival gate. For specific bus numbers, stop by the Information Center or ask outside at the bus ticket booth. (Travel Time: Approximately 1 hour). Airlines that fly from Gimpo to Jeju are Eastar, Korean Air, Asiana, Air Busan and Jeju Air. When you arrive at Incheon, all signs are in English and you will find English speaking staff at Information desks. You must take All-stop train (taking 40 min. You must get off at Gimpo International Airport (after 6 stops), operation interval: 12 min.) You must not take Express Train, non-stop running between Incheon Airport station and Seoul station (you cannot get off at Gimpo International Airport, if you take Express Train). 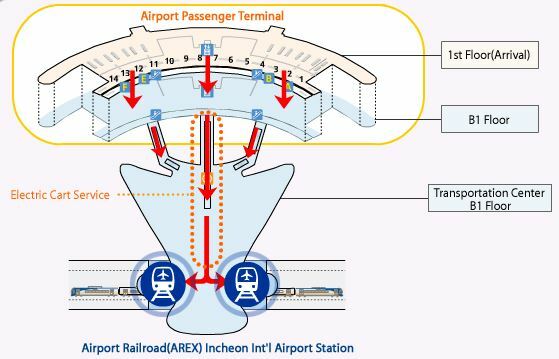 (tip : Airport Railroad is indicated by “yellow-colored letters” on the directional signs on the arrival floor of Incheon Airport. Simply follow the “yellow-colored letters” to reach the Incheon Airport Railroad station). When you arrive in Jeju International Airprot, you can use Airport Limousine Bus to go to Lotte Hotel Jeju.